Garage floor plans, shed plans, and home addition plans are very simple to do and can be done by anyone with little to no assistance needed. 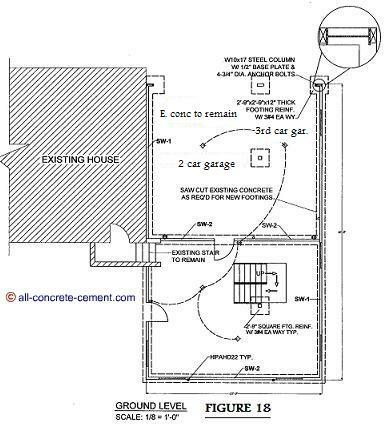 The garage floor plan shown here is a self taught skill that I learned after years of working in construction. I believe anyone can learn these skills whether they are artistic or not. Figure 18 is a ground level home addition plans that I designed, drafted, and constructed. The owner of this home had an existing concrete driveway 26 feet wide by 62 feet long. The intention was to minimize the damages to the existing concrete which will become the slab for the garage floor. As noted in the plans, existing concrete had to be sawed, chipped, and removed to allow installation of footings and foundations. This was excavated down to frost line of 30 inches below the concrete driveway. Due to the setback requirements the width of the garage was set at 27 feet. That means for three car garages there was only 3 feet of wall left. In order to satisfy the jambs requirements for wind and seismic loads, steel columns had to be added at the front entrance. The main objective of the addition was to enlarge the family room and add more bedrooms and bathrooms. After walking the property for the first time, basement extension being one of the options considered was eliminated. Adding on the garages were not part of the initial plan but after seeing the big driveway and patio, the focus turn into making the existing concrete usable and still accomplish what the owner wanted. As shown in the plans, the front portion became the garage floor plan while the back side turned into storage shed plans. On top of the garage adjacent to the existing house was the extension to the living room with an added bedroom and bathroom. Directly above the storage was the master bedroom and master bath. At the end, the owner accomplished what he wanted with added benefit of 3 car garages to house his vehicles during snow in the winter months along with extra room for storage. All of these added benefits were for the same budget that the owner put aside for the house addition.